It's better to do a thing than live in fear of it. I have created a Kickstarter video and I want to extend my heartfelt thanks for all of my supporters. They should feel pride at supporting self-publishing. Remember, everyone has a story to tell. Dorian Gray returns with an unusual twist in a new book series "The Wolf of Dorian Gray". 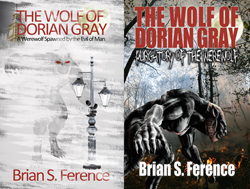 Self-publishing indie author Brian S. Ference has released the first book subtitled "A Werewolf Spawned by the Evil of Man" with worldwide distribution. He is simultaneously launching a Kickstarter crowdfunding campaign to fund the creation of the second book. Platinum backers of the campaign will have their names and descriptions written in as characters to the second book "Purgatory of the Werewolf". There are several stretch goals in the campaign and if "Bonus Level Four" is achieved then all backers pledging $25 or more will receive all three books in the series as both Audiobooks, eBooks, and printed 6"x9" perfect bound paperback format. To view the campaign video go to http://www.thewolfofdoriangray.com. When asked about what motivated him to self-publish the series Brian responded, "I remember winning a state-wide creative writing contest when I was in grade school and being interviewed on the radio. From that moment on, I knew I would one day publish a book and I have finally done just that. It was truly a labor of love for me and I am intrigued by the independent publishing process. I learned as much as I could and have also designed my own book covers and website. I have created a promotional video for my Kickstarter campaign and I would like to extend my heartfelt thanks for all of my supporters. They should feel pride at supporting self-publishing and helping authors everywhere to tell their stories. Remember, everyone has a story to tell. Whenever I became discouraged I reminded myself of one of my favorite quotes: 'It's better to do a thing than live in fear of it.' I have lived my life that way and that is the attitude that any independent author needs to succeed." The first paperback ISBN 978-0-9983252-0-0 can be purchased from BarnesandNoble.com, Amazon.com, or the author's website http://www.brianference.com. It can also be found in dozens of different ebook formats at the iTunes Bookstore, Kobo, Scribd, and more. The author is currently running an Amazon Giveaway with 50 ebook copies of the book as well as a GoodReads.com Giveaway with 25 signed paperback copies of the book. Enter at http://www.thewolfofdoriangray.com or on Twitter @brianferenz. "Sage tried to ignore the flash of blood, as the image of the giant grey wolf rushed back into her mind. During one of her nightly gatherings in Epping Forest, she was astounded to come across the animal—which was thought to have been hunted to extinction in England well over two centuries ago." So begins The Wolf of Dorian Gray. This expanded edition of the classic philosophical fiction by Oscar Wilde, features all-new scenes in a compelling tale of love, lust, and the werewolf spawned by the evil of man. The story, set in late 1800’s England, follows the life of Dorian Gray, who through ancient Romani magic’s and the skills of an astonishing artist has had his fate and soul irrevocably linked with the last remaining wolf in the forests of England. Dorian revels in the experiences of first love, delights in the art and beauty of the world, relishes the freedom of his youth, and is awakened to the many pleasures of life. His friend and mentor, Lady Helena, provides a guiding hand as he struggles with his conscience and the purpose of living. Meanwhile, the wolf begins to grow and change into a hideous monster that is ravaging the countryside. What will happen when the wolf comes to London? Can Dorian save his soul? Or will the beast consume it and his life, along with those of his friends and loved ones? Complete with adventurous romance, harrowing escapes, hell-bent revenge, and a werewolf terrorizing the gentry; The Wolf of Dorian Gray transcends this classic work of literature into a compelling and most delicious read. Read up to 20% of the book free at http://www.thewolfofdoriangray.com. Brian S. Ference lives in Cave Creek, Arizona with his wife Rachel and two children Nathan and Lena. He has always had a passion for reading and writing from a young age. Brian loves new experiences, which has included operating his own company, traveling the world, working as a project manager, diving with sharks, and anything creative or fun. He is always up for a new adventure such as writing or other artistic pursuits.